This bidri water pipe (huqqa) base has a floral decoration of poppies and irises, the upper and lower areas of which are framed by geometric friezes. The motifs are highly stylized, in accordance with Islamic tradition that prefers abstract or calligraphic floral themes to animal or human representations. In pieces dating from this period, arabesque ornamentation was most often replaced by a more symmetrical, balanced and subdued arrangement that displayed an acute sense of volume. The elegance peculiar to this production played upon the contrast between the shimmering inlaid metal decoration and the black ground. The bell shape of the huqqa is the result of developments that took place around the 1730s and 1740s when this new shape superseded the spherical belly form that had previously been fashionable. The term bidri refers to the type of metalwork produced in the town of Bidar. This involved the use of cire perdue technique to produce the cast which was then generally decorated with inlaid silver or brass on a blackened ground composed of a mixture of red clay and resin. 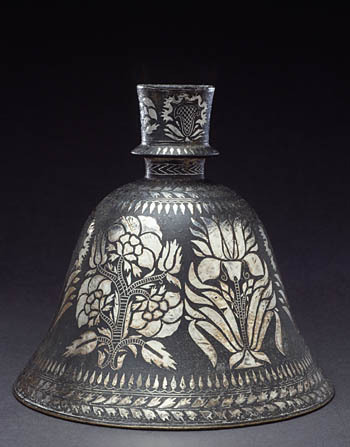 In the early 18th century, bidriware underwent a major change, characterized by a finer finish, an improved and more reliable quality of metal inlay, and smoother surfaces. The town of Bidar was the capital of a Muslim sultanate, located south of the regions under direct Mughal rule. From the 15th century, it became the main centre for Indian metalwork production; the creative techniques employed often derived from Persian decorative models inlaid with silver and gold.